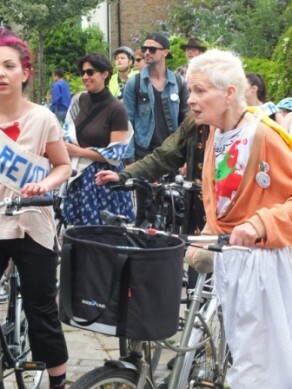 This Saturday the Healthy Air London team were at The Urban Outdoors Festival with designer and campaigner, Vivienne Westwood, her Climate Revolution team, and Camden Council. This community festival was a chance to celebrate our great urban outdoors and encourage sustainable and healthy lifestyles to help protect it. 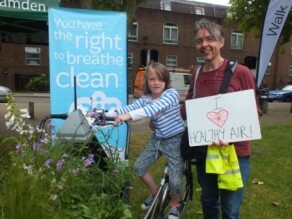 Families, friends and cycling campaigners joined Vivienne on the Clean Air Bike Ride to enjoy some low pollution cycle routes around Camden. 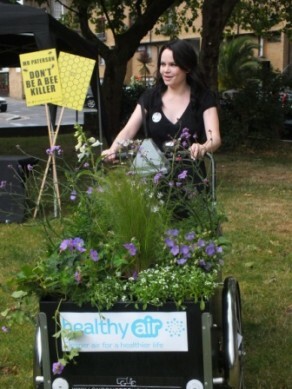 The Healthy Air Campaign’s clean air bike, Gertrude, was a success, not only with surprise guest singer/songwriter Duffy (with whom we almost had to fight to get our bike back) but also with all the people we passed along the way. Even car drivers who had to wait for us to pass couldn’t help but smile as Gertrude went by. The bike was fitted with an AQMesh monitor so that we could monitor levels of nitrogen dioxide along the bike ride but due to the short monitoring period it’s difficult to make conclusions on the concentration levels recorded. The most interesting thing to look at is the shape of the graph and in particular how levels drop during the cycle ride as we got off the road and went through Hampstead Heath. The cycle ride is also the only time during the festival that levels went below the annual mean limit: pollution levels on the quiet back roads were lower than on the green space by Castlehaven Community Centre where the festival was held, which was just round the corner from the busy roads around Camden Market. These results highlight how you can reduce your exposure to air pollution by taking quieter routes and getting away from busy traffic. Castlehaven Community Centre have asked us to go back to talk to their community group about air pollution issues in the capital. If you’d like us to visit your community group in London then get in touch. 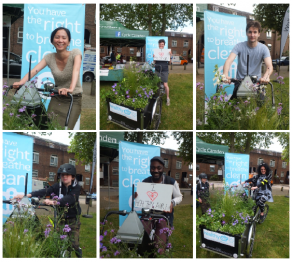 Thanks to Air Monitors, London Green Cycles and Camden Garden Centre for kitting us out on the day. 1. What is the orange line at 200? 2. Annual mean limit. Is that a target? 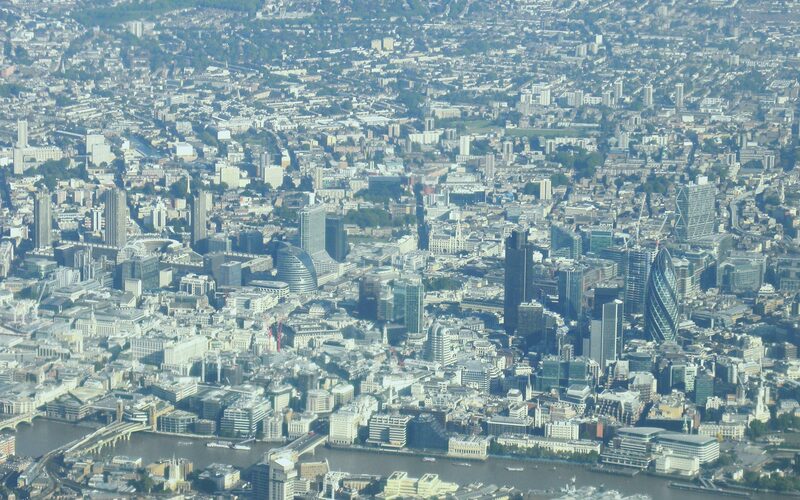 Your questions all refer to the national air quality objectives and European Directive limit and target values with which the UK must comply as part of air quality law. So in other words, yes targets that have been set to give a certain level of protection to human health from air pollution. Limit values are legally binding and target values are to be attained where possible. They vary in how they are measured and have a date by which they should be achieved. 1. So the orange line on the graph is the one hourly limit value for nitrogen dioxide (NO2). It specifically outlines that an average concentration of NO2 measured over an hour of 200 microgrammes per cubic metre should not be exceeded more than 18 times a year. This is a legally binding objective that should have been met and maintained by the 1st January 2010. 2. The annual mean limit for NO2 describes that the annual mean concentration of NO2 should not exceed 40 microgrammes per cubic metre. This is also a legally binding objective that should have been met and maintained by the 1st January 2010. You can read more about this on Defra’s UK-Air site or in the European Commission’s site. Incidentally, notice that we’ve said “should have been met”. These legally binding targets haven’t been met in the UK and are the basis for ClientEarth’s legal challenge and the European Commission’s own legal proceedings to get the Government to take more action.